The colours and discs are based on the Arms of the Duchy of Cornwall, England. The fifteen discs are surrounded by a pair of narrow bands known as a double tressure flory, a version of which appears in the Arms of the King of Scotland and honours the first Scottish settlers of this region. The parallel bands recall the two row wampum belts presented to the early settlers by the Native peoples. The fleurs-de-lis recognize the French heritage of the City of Cornwall. This means “For the Motherland”. 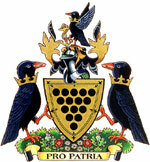 The Cornish chough with outstretched wings recalls the Arms of the United Counties of Stormont, Dundas and Glengarry and repeats the elements of the Arms of the Duchy of Cornwall. The coronet of fleurs-de-lis worn as a collar by the chough is a reference to the French settlers who played a central part in the development and settlement. The anchor signifies that Cornwall is a port. The Cornish choughs with the fleurs-de-lis coronets continue the motif in the crest. They stand on a grassy mound with roses, thistles and edelweiss symbolizing the main ethnic groups that immigrated to Cornwall (English, Scottish and German). 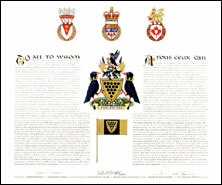 The announcement of the Letters Patent was made on October 14, 1995, in Volume 129, page 3593 of the Canada Gazette.